Well, I guess I have some "'splainin'" to do as to why this is a wee bit late. Arr!! It's all legit, I promise (like this has never happened to YOU!). Here's my story and I'm stickin' to it: I had the perfect opportunity to stamp and make my Sketch For You To Try card last night, as I took the girls to Open Gym night again to play until 10 PM. After dropping them off around 7:30, I came home and went straight to my desk and started pulling things out to work with, and had a pretty good idea as to where I was going with my card. That's when it all started going south. Nothing was working. The stamps, paper, cute ruffly trim (I was going for a pink and kraft baby card)--NOTHING! So there it was, still in bits and pieces at 9:45 and I had to go and get the girls. I trashed the entire thing. After we got home, I stared at my desk blankly and then decided to just go to bed and "sleep on it". That I did. So in the "twinkly-sort-of-asleep-but-waking-up" time in bed this morning, I had a "vee-yu-sion" (a vision) and completely "saw" this card. No, I didn't just pop out of bed and put it together, I STILL had to have my coffee first--gah!! (like you wouldn't have done the same thing!). Anyway, it's a combination of today's Sketch For You To Try from Jen, Tuesday's TCPTUES57 color challenge (that you can find all the details about HERE on Toni's blog), and Thursday's Ways To Use It Challenge WT217 from Julia over on SCS. That's some pretty complicated thinking before I even wake up if I do say so myself! So that's it. Can you relate? Have a swashbucklin' day! Time to go scrub the deck. SUSIE Q-TIP: When pulling the lids off of your Copics (or any markers just to be safe), it's a good idea to NOT do this anywhere near your image you are coloring. They tend to splatter sometimes and I've had more than one project ruined by not remembering to do this. Grrr!! Sometimes you can blot the mistakes with a Colorless Blender, but that doesn't always work, especially if it's a darker color. So funny, Sus -- last night I was wracking my brain, trying to come up with a way to use TCP and green and blue with this, but came up empty! Look at you go, girl! Awesome!!! I love this! I thought about using top note as well and didn't, but I love it on your swanky sfytt! Your treasure scene is TDF! Susan, I can relate and more than I like to admit :) but good things take time ( a few takes :)) - and this one looks AMAZING - really liking the way you used the colors and the way the card is laid out! - great job, in th end it came together nicely! 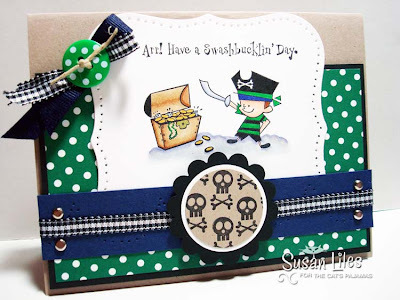 I love the colors on this darling card, Susan!! I love this, Sus!! That little guy reminds me of a cartoon character my DD used to watch - I'll have to go check it out. Love this card, and the story behind it - that's happened to me too, although I don't think my waking up vision turned out nearly as spectacular as yours!! LOVE IT!! I did not know this about the markers!! You know what? I think I need to sit down with you while you're doing your projects just to get ALL of these tips down. It's amazing what you pass on that seems so small yet is SO BIG!! Your card is lovely -- I love the colors!! Hope you had a very nice Mother's Day!! I meant to get an email out to all my Mommy friends, but after I got my work done Sat. I vowed to stay off the computer the rest of the weekend! LOL. Hugs!! Soo Cute! I love this little pirate. Great CArd. And I've totally had the same thing happen to my images, hate those copic splats!